It's not hyperbole to say that my world has been shaken in every possible way since I last properly blogged nearly a month ago. Yes, there has been an earthquake with the epicenter located, I'm reliably told, next to my friend Kevin's tomato plant in his garden in Mineral. Yes there has been a hurricane whose epicenter, I'm convinced, was right here on my block where we lost something like ten aged oaks which squashed seven cars to pancake proportions. No, the earth-shaking thing that happened here was the unexpected death of my beloved Father, Tom Osdene--in so many ways, the inspiration for almost everything I've ever done or accomplished in my life, and most assuredly the catalyst for and soul of my kitchen. In the months to come, I'll introduce you to some of the culinary marvels my father taught me and share some of the interesting, even amazing and often funny stories of his legacy in the kitchen and in the world. I promise they'll be worth sticking around for. In the meantime, with all of these earth-shaking events having happened--oh yes, and Felix headed off to start college three days after the funeral, and came back again a week later with five lovely new friends, evacuated from Irene for 4 days--well, suffice it to say I've got lots of tales to tell. With all of that in mind, I do have to say, that the most overwhelming part of all of this heart-ache and travail has been the veritable ocean of love that's swept me away. I've been cosseted by the waves of love born in with a flood of flowers, casseroles, notes, visits and well, just about every thoughtful thing one can imagine raining down on me. I amsupremely lucky to have the best friends, family and yes, even readers, that anyone could imagine or wish for. Among the lovely things brought to me to assuage my grief were some gorgeous tomatoes from Nancy and Ches. Now, it just shows how well they know me to know that a gift of beautiful, perfectly ripe Hanover tomatoes goes a long way to restoring enthusiasm and the urge to rejoin life and get into the kitchen. A sentiment with which my father would most heartily agree. When those rosy beauties came my way, I was inspired to create what may be my perfect late summer comfort food....panzanella. I think it may be Greek in origin, or in any case, mine turned out to be when I hurled some dry oregano into the vinaigrette and laced it full of lots of feta cheese that I happily had stowed in the fridge. 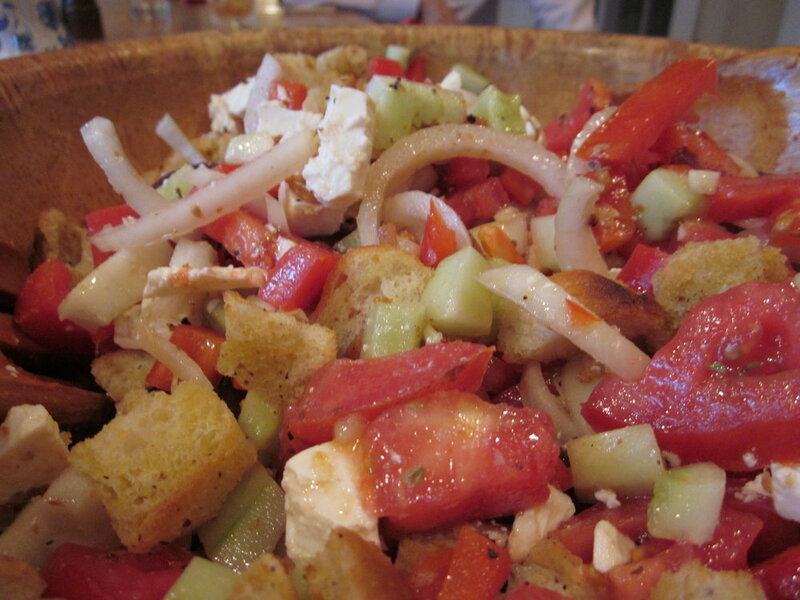 The croutons dripping with vinaigrette, the feta, tomatoes, olives, red peppers....well really, with very little effort, I had put together a post-funeral feast that was just what the doctor ordered. It was a relief to hit the kitchen, to slice the onion as Daddy taught me, and to know that though he wasn't literally joining us for the meal, in a very real way, he's not very far away at all. Heat 3 tablespoons olive oil in a large saute pan. Add the bread cubes and sprinkle with salt. Cook over low to medium heat, tossing frequently, for 5 to 10 minutes, until nicely browned. Add more olive oil as needed. Place the cucumber, red pepper, tomatoes and onion in a large bowl. For the vinaigrette, whisk together the garlic, oregano, mustard, vinegar, salt, sugar and pepper in a small bowl. While still whisking, add the olive oil and make an emulsion. Pour the vinaigrette over the vegetables. Add the feta, olives and bread cubes and mix together lightly. Set aside for 30 minutes for the flavors to blend. Serve at room temperature.